You can see all the configured Notifications from the Manage Notifications node. From this section, you can Clone, Edit and Delete existing Notifications. This table lists and explains the columns in the Notifications window. This is the name of the Notification. The default Notification names are descriptive, corresponding to the Event reported. When you create your own notification, you can enter whatever name you wish. This indicates whether the Notification is Enabled or Disabled. This defines to what the Notification should be applied. The options are: Any Website, a Website Group, or a single Website. From the main menu, click Notifications then New Notification. In the Name field, enter the name of the new notification. In the Status field, select enable or disable. From the Event dropdown, select the relevant option. In the Group field, select enable or disable. From the Scope field, select the relevant option. In the E-Mail Recipients field, click and enter a recipient. In the SMS Recipients field, click and enter a recipient. In the Excluded Recipients field, click and enter a recipient. 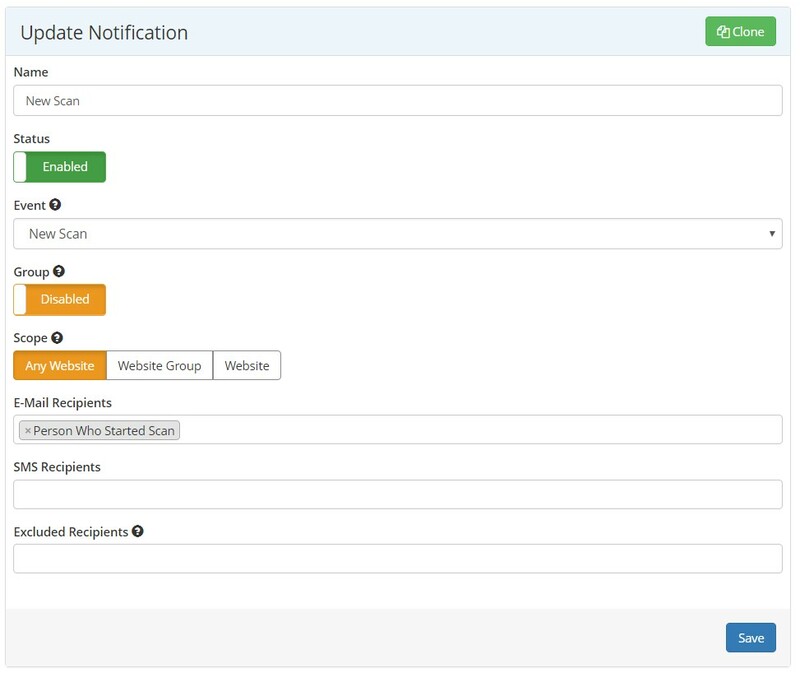 From the main menu, click Notifications then Manage Notifications. The Notifications window is displayed. Next to the notification you want to clone, click Clone. The New Notification window is displayed. In the Name field, enter a name. Next to the notifications you want to edit, click Edit. The Update Notification window is displayed. In the Name field, edit the name. Next to the notification you want to delete, click Delete. The Delete Notification dialog is displayed.